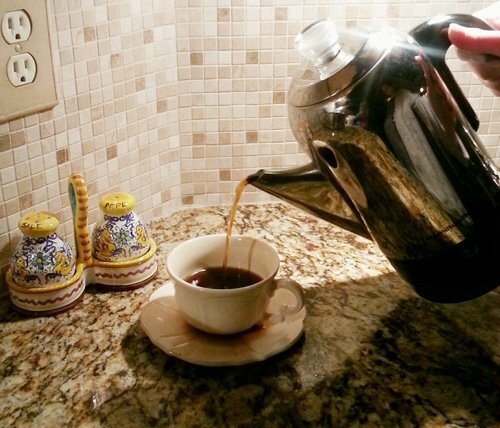 The Coffee Percolator – still popular with some coffee drinkers. The coffee percolator – derided by many, but favored by a loyal group of genuine coffee lovers. 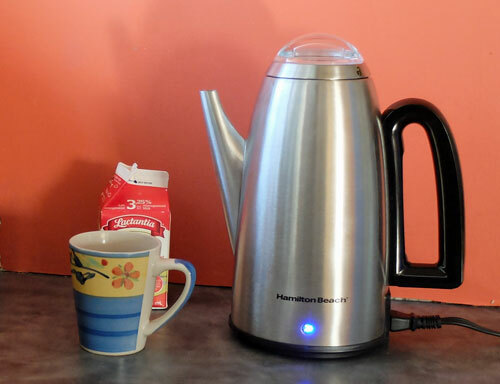 Electric percolator for a quick, rich brew. Go back twenty years or so and coffee percolators were all the rage. You could, and still can, get them in a stove-top or plug-in version. Since the growth in popularity of gourmet coffee, thanks to roasters and coffee shops like Peet’s Coffee and Starbucks, the use of coffee percolators has declined. How come? Well, if you are a gourmet coffee lover, there are a couple of things about percolators that won’t quite work for you. First, the water is boiling when it rises up and soaks through the ground coffee. Coffee experts heat the water to a temperature a little shy of boiling point and then pour it over the coffee grinds. The same is true of automatic brewers of all kinds. The thermostat is set to heat the water to a level just below boiling. The problem with the water boiling is that it tends to draw out some of the bitterness in the coffee. All that said, and regardless of what coffee aficionados may say, percolators still have their fans. There are many people who just wouldn’t want their coffee made any other way. 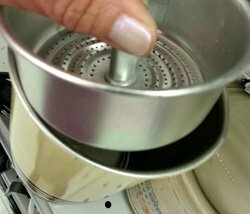 The percolator filter basket in which you place the ground coffee. Also, a perhaps unlikely group of coffee lovers are discovering percolators for the first time. Why? Because most percolators have no plastic parts. A growing number of people don’t want to have to worry about chemicals leaching out of plastics when in contact with hot water. And if you try to find a regular drip brewer with no plastic parts, you’ll have a lengthy search on your hands. Even the modest French press usually has some plastic as part of its construction. Whether you just love coffee made with a percolator, or are in search of a plastic-free brewer, there are still plenty of models to choose from. You can find a wide selection of coffee percolators at Amazon. Pouring a rich, dark coffee from your coffee percolator.